Something I really wanted to do during my time in Thailand was get a sak yant tattoo. I’d been thinking of getting a tattoo for a while but wasn’t sure exactly what I wanted and didn’t just want to get one for the sake of it. There are obviously so many people who get tattoos in Thailand who end up regretting it because it looks like a 3 year old drew on their skin in crayon. When I heard about sak yant, it sounded perfect. 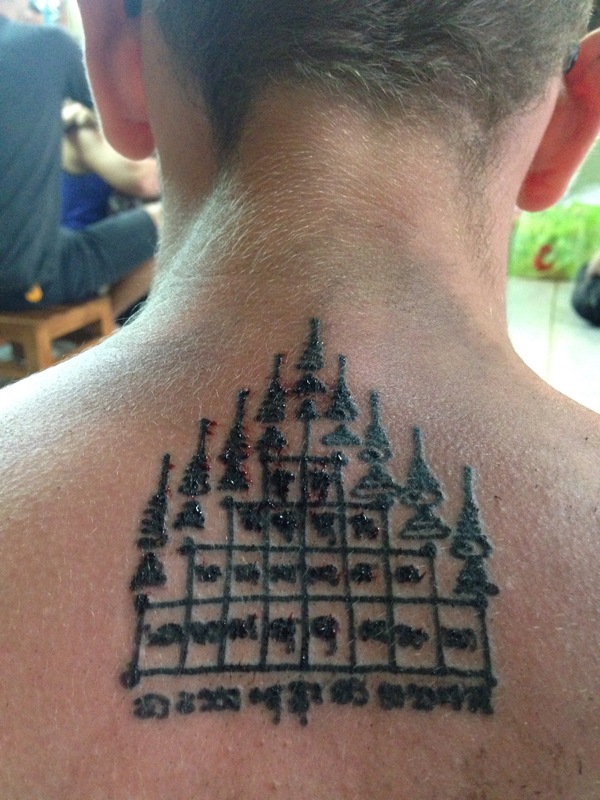 It is done by a Thai monk in a temple and is regularly visited by Thai people wishing to add to the ever-growing plethora of tattoos on their back. You don’t pick the design you want – the monk decides what he will give you based on your aura and which tattoo he thinks best fits your personality. For me, this is what made me really want to go. Not only would I not have to make a decision on what I wanted, but I’d end up with a tattoo which was personal to me. As it happens, most tourists end up with the same design – the gao yord, but it looked fantastic and given the way it’s done, no two tattoos look exactly the same so you still maintain that personal touch. It just seemed the perfect way to round off what has been an incredible year for me. The only obstacle I had to overcome was actually plucking up the courage to get it done. Having never had a tattoo before I didn’t know how painful it would be or if I’d regret it as soon as it was done. Despite these reservations, I was adamant I’d do it. The most famous place to get an authentic sak yant tattoo is at Wat Bang Phra, just outside of Bangkok. Getting there either involves a taxi (around $50 I’ve heard for the round trip including waiting time) or a bus/motorbike taxi which I opted for to arrive. The temple opens for business at 8am and you want to get there for opening as, even though the tattoos are quick, it gets very busy with locals getting top ups. The last thing I wanted was to be sat there for hours as I knew I’d probably bottle it. For the bus, minibuses depart from Victory Monument. I went for the 6am bus which was a good option and got me there about half an hour before opening. There are loads of minibuses at Victory Monument, but if you exit the BTS station at Exit 4 and ask around for the bus to Nakhon Chaisi, you will be pointed in the right direction. Some of the bus station workers even asked if I wanted the bus for the ‘magic tattoo’ so it wasn’t too difficult to find. The minibus cost 70 baht for around an hour long journey. The driver knows where to drop you off and you end up across the road from a big Tesco Lotus. If you walk over the bridge across the busy road, there should be some motorcycle riders waiting. I had one waving to me as I headed over the bridge. They know why you’re here and will charge 100 baht for the 20 minute journey to Wat Bang Phra. When you get to the temple, you have to pay but you’re a million miles away from the £100s tattoos in the big city. A sak yant tattoo costs a grand total of 75 baht (£1.50) which you present as a donation. In return you get a candle, incense, flowers and a packet of fags to present to the monk before your tattoo. Apparently these donations are recycled. I’m not quite sure what the cigarettes signify. Perhaps they’re what get the monk through an entire day of tattooing people. There was already a group of about 10 people in front of me and the small room filled up as the clock headed towards 8am. I wasn’t even sure I was in the right place – this didn’t look like a room to get a tattoo in. But, sure enough, at 8am, the monk came in. Immediately everyone gathered round a tiny stool at the front of the room. This wasn’t just a tattoo – this was a spectator sport. Dozens of Thai people would be sitting inches from my face as I got what I imagined would be the most painful experience of my life. I thought I’d hate watching other people getting it done but it actually calmed me down. Everyone looked so chilled and it just looked as though the monk was stencilling on their back. I started to think it wouldn’t be too bad. Then it was my turn. I had to bow three times to the monk, making sure never to stand above him as this is insulting. I removed my t-shirt and leaned over a cushion, which would act as my pain relief. I psyched myself up for it to begin. This monk didn’t use the traditional bamboo method, instead using a gun. Apparently his arm got tired! The pain was intense but not in the way I imagined. I always envisaged a stabbing pain but it was more like a drilling feeling. The only thing I can relate it to is having thorns dug into your back constantly. The pain also gets worse as it goes on. However, I didn’t cry, I didn’t pass out and it’s not an agonising pain. I could never call it soothing or relaxing but it certainly had a therapeutic quality to it. And then, less than 10 minutes later it was done! I couldn’t believe it was over already. I immediately asked one of the others in the room to get a picture and was astounded at the detail. The gao yord has 9 pillars, representing the lucky number 9 in Buddhism. On top of this, the hordes of tiny symbols act as protection from various things and good fortune in different areas of my life. 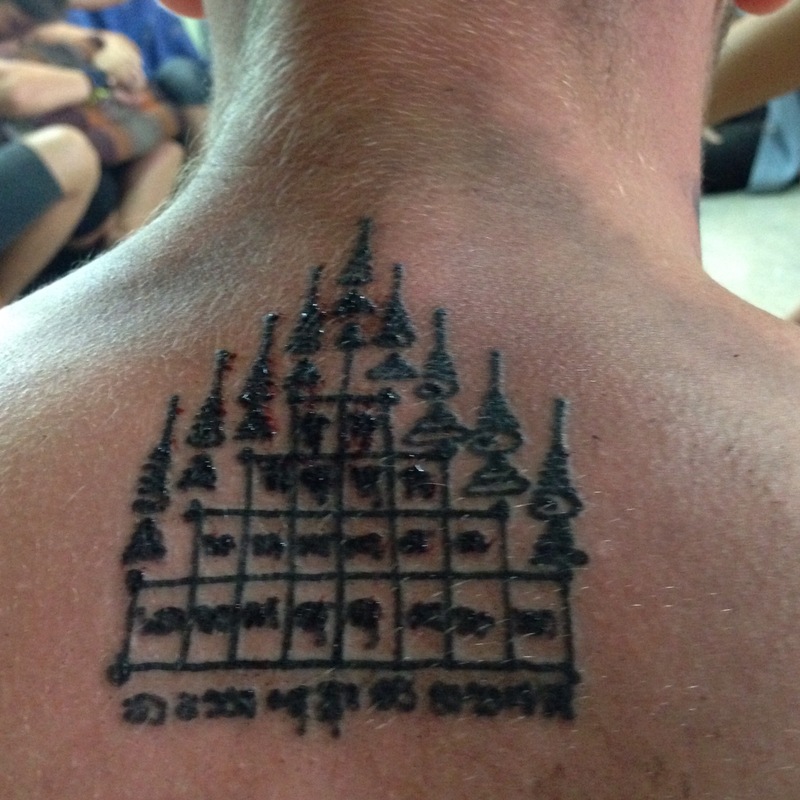 Following the tattoo, I met the only other Westerner there and we joined a local in the building next door to offer a donation to the monks and receive a blessing which was a really great way to round things off. We then shared a taxi back to Bangkok which cost about 500 baht between the three of us. Overall, it was a truly incredible experience and one which I don’t regret doing at all. Not only do I have a beautiful tattoo which means something but the whole experience was one which I’ll remember for the rest of my life. I couldn’t think of a better symbol to take away from my travels. If you’re interested, there’s a really great guide on Where Sidewalks End which outlines all the practical stuff in detail. So glad you had such a good time Jack! Glad my instructions on getting there helped too 🙂 Looks like you got an awesome yant and had an amazing time, mate!